In case of an accident or emergency, call the NH State Police at 1- 800-525-5555 or 911. Be sure to give specific details concerning you, your emergency, your location and a call-back number. We want you to be safe on the trails! The NH Fish and Game Department and the White Mountain National Forest are partners in a mountain safety education program called "hikeSafe" to help get the word out on what hikers need to know. As part of this program, the Hiker Responsibility Code is posted on hikeSafe signs at all major trailheads in New Hampshire. The code applies to all hikers, from beginners on a short hike to experienced outdoor enthusiasts embarking on an expedition. Please practice the elements of the code and share the code with fellow trekkers. This will help increase responsibility and reduce the need for Search and Rescue efforts. Knowledge and gear. Become self reliant by learning about the terrain, conditions, local weather and your equipment before you start. To leave your plans. 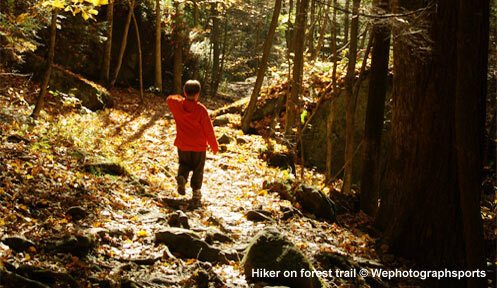 Tell someone where you are going, the trails you are hiking, when you’ll return and your emergency plans. Additional resources for hiking preparation, including how to plan your trip and what to know if you're hiking with children or a group, can be found at hikesafe.com. To have a safe, enjoyable outdoor experience and help reduce search and rescue efforts... BE PREPARED. Proper planning and preparation before you go will help you have a safe and memorable trip. Remember to practice the Hiker Responsibility Code to ensure everyone's safety. It's your responsibility. In case of an accident or emergency, call the NH State Police at 1- 800-525-5555 or 911. Be sure to give specific details concerning you, your emergency, your location and a call-back number. Offers mountain leadership program, various backcountry skills workshops and other specialty courses. Offers Outdoor/Wilderness Leadership School (OWLS), Advanced Leadership & Emergency Care (ALEC), Wilderness Institute for Leadership Development (WILD), and other wilderness and emergency medicine programs. Offers private and group instruction in backcountry travel, 4-season climbing, and other aspects of mountaineering. Offers private and group instruction in backcountry travel, 4-season climbing, and other aspects of mountaineering. Staff can be hired for talks and presentations. A nifty fact sheet that explains how to use a map and compass. Check it out.